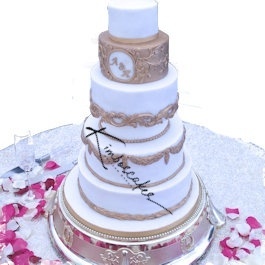 Regal wedding cake, Asian inspired with a modern twist. 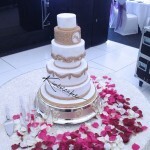 All tiers of this gorgeous wedding cake are made with eggless sponge. 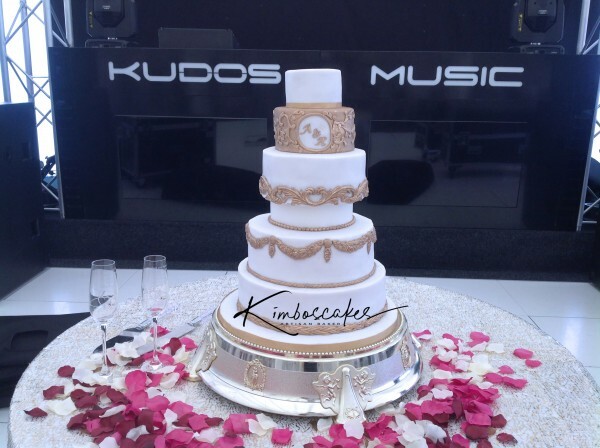 Flavours for each of the tiers were chosen from our vast range and consisted of; Mango and Cardamom, Fresh Strawberry sponge, Vanilla, Lemon and Lime, and Red Velvet. 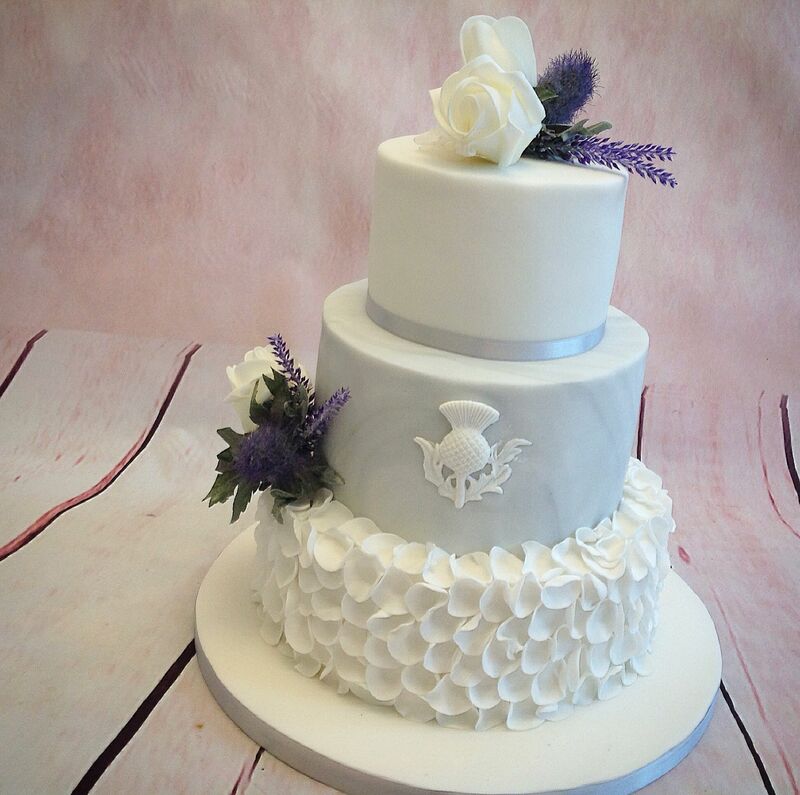 Our egg free wedding cakes, like all others, are baked fresh to order. We use only the best available fresh ingredients to create our flavours. 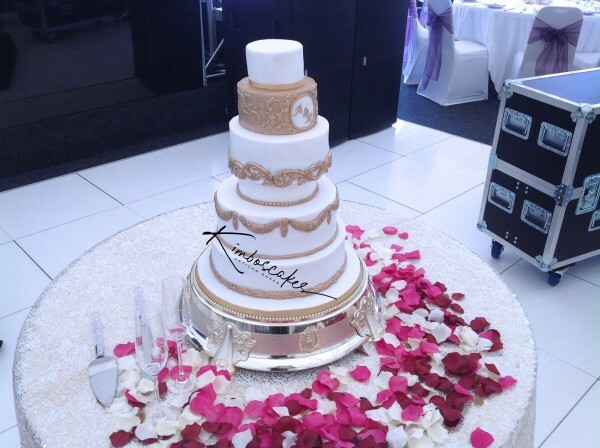 The tiers are then decorated with a gold rope effect applied to the bottom two tiers, with a gold rose swag draped around the top edge of the 10inch. 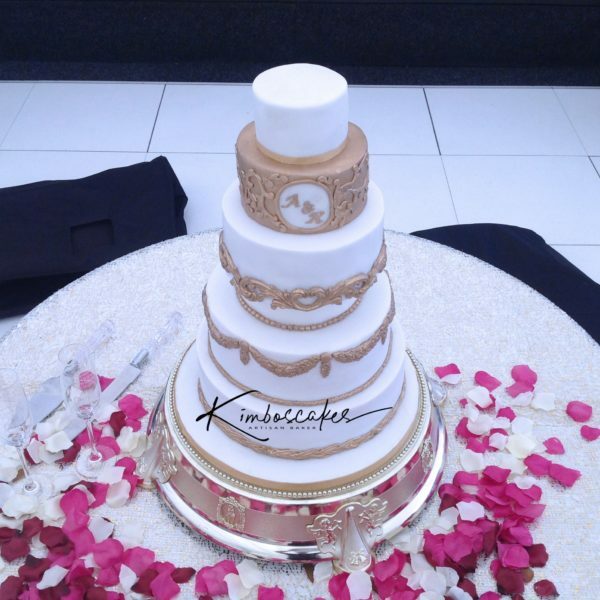 A cake separator decorated with white fondant is positioned in-between the second and third tier with a gold beading around the base. 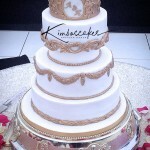 To compliment the design the third tier was decorated with a gold regal scroll detailing to the base of the cake. 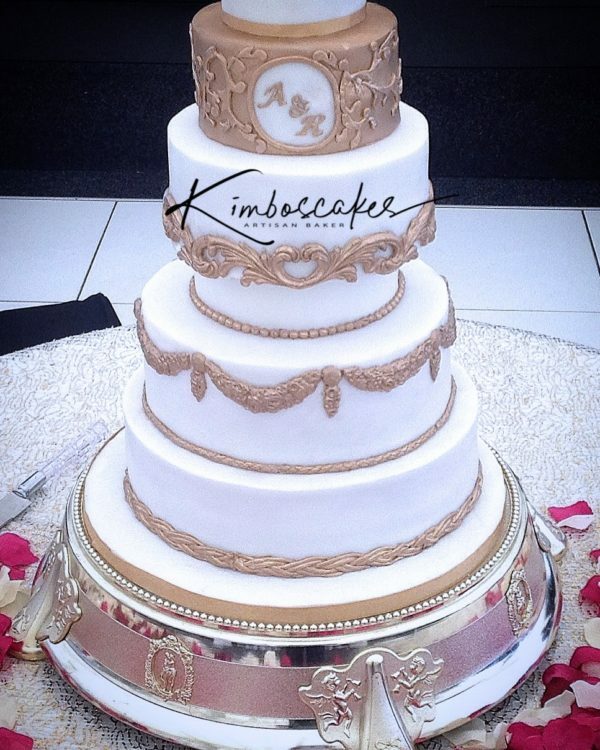 On the fourth tier, this has been enrobed with a gold fondant and Delicate Scroll detailing which encompasses a personal touch with the bride and groom’s initials. To balance the overall design the top tier is decorated with a gold ribbon to the base of the cake. 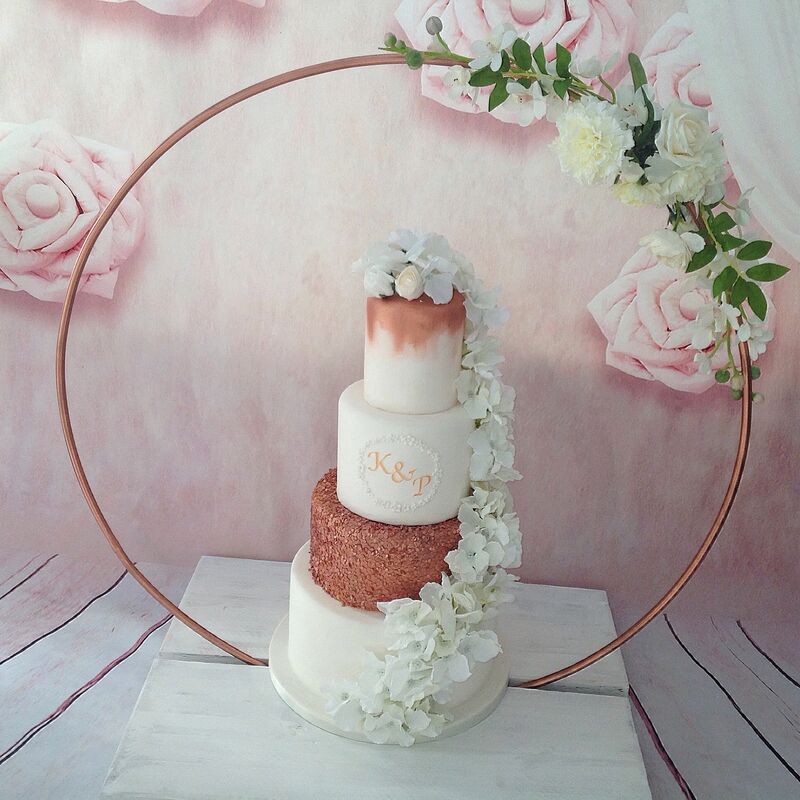 Delivery and setup of the regal wedding cake was made at the bride and groom’s venue. 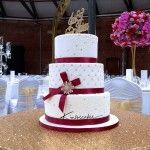 Their chosen venue was the Nadee at Findern, Derby. (Now known as Heathland Grove). They have undergone extensive rebuild and refurbishment. 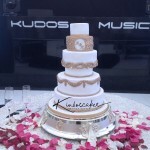 This has totally transformed the venue.